We performed Beethoven's Mass in C with ConTempo String Quartet and orchestra on Saturday 26 January 2019, in St Nicholas' Collegiate Church. See videos and photos from our May 2018 concert. Read more about the concert. Read more about this concert. See photos. St Nicholas Christmas Fayre Saturday 3 December at St Nicholas Church. See photos. Christmas Carols at Aldi, Knocknacarra Singing around the store - see photos. A concert with Welch male voice choir Cantorion Gogledd Cymru. Saturday 17 December 2016, Town Hall Theatre, Galway. Poster here and more details here. Some photos from this concert. 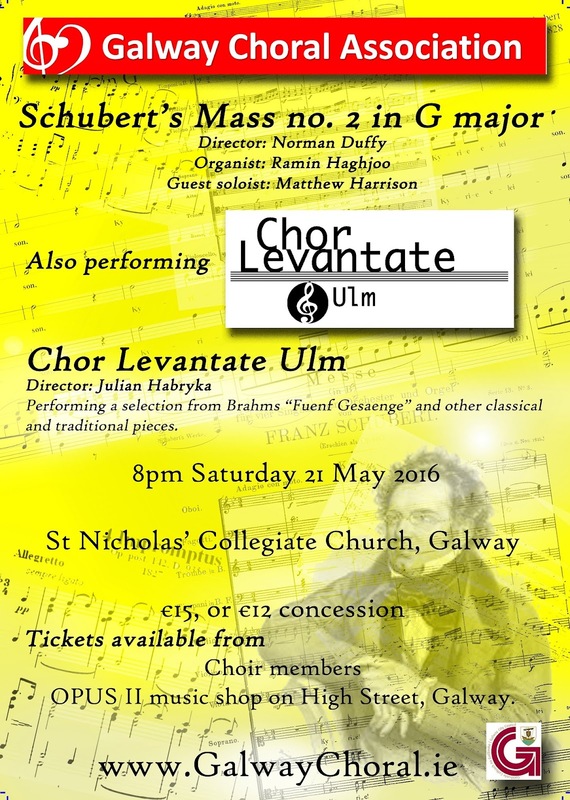 We performed this work on 21 May, at a concert where we hosted a visiting choir from Ulm, Germany. 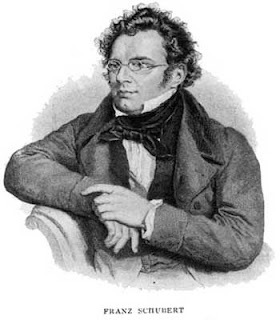 Schubert’s second mass was composed in less than a week (March 2 to 7, 1815), the year after his first mass had been successfully performed in Schubert's home parish. The second mass was originally more modestly scored than the first, requiring only a string orchestra and organ in addition to the soprano, tenor and baritone soloists and SATB choir. The mass follows the traditional format and contains some of Schubert’s most approachable and attractive choral writing. With soloists and accompanied by organ. Saturday 30 January, 8pm at St Nicholas Collegiate Church. This very popular piece of music is often paired with the classic setting of the Requiem by Gabriel Faure. While Durufle was clearly and understandably influenced by Faure’s masterwork, he is very much his own man. It was completed in 1947 and was published after the fall of the Vichy Government by which its composition had been commissioned in 1941. It was a work very close to Durufle’s heart and he dedicated it to the memory of his father. It is very approachable while offering some challenges to singers. The choral style will be familiar to singers who have sung Durufle’s Ubi Caritas. A full range of learning tools are available on line – some are free of charge.